Darwin’s Finches in Galápagos face possible extinction within decades, according to a new study published December 18th by the University of Utah. Mathematical simulations show that while parasitic flies are killing the finches, efforts to eradicate the flies might hold out some hope for saving the birds. The new research “shows that the fly has the potential to drive populations of the most common species of Darwin’s finch to extinction in several decades,” says biology professor Dale Clayton, senior author of the study published online in the Journal of Applied Ecology. Several approaches may be needed, such as introducing fly-parasitizing wasps, removing chicks from nests for hand-rearing, raising sterile male flies to mate with females so they can’t lay eggs in finch nests, and using insecticides, including placing pesticide-treated cotton balls where birds can collect them to self-fumigate their nests. Mockingbirds were more important to Charles Darwin’s theory of evolution than finches, partly because he failed to label finches he collected in the Galápagos to denote the islands where he collected the birds. Nevertheless, Darwin observed how different Galápagos finch species evolved varying beak and body sizes. Darwin’s finches live only in the Galápagos Islands, off the coast of mainland Ecuador. The finches began as one species and started evolving into separate species an estimated 3 million to 5 million years ago. The new study dealt with medium ground finches, Geospiza fortis, among the most common of at least 14 species and perhaps 18 species of Darwin’s finches. One of them, the mangrove finch, already “is facing potential total extinction because it is present in only two populations on a single island, Isabela,” Koop says. 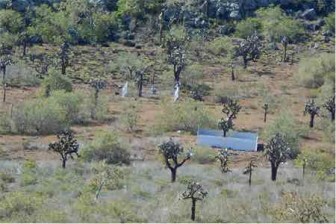 The study was performed on Santa Cruz Island in the Galápagos. An estimated 270,000 medium ground finches live on that island and perhaps 500,000 live throughout the Galápagos Islands, Clayton says. Museum records indicate the nest fly arrived in the Galápagos Islands in the 1960s. They first were documented in bird nests there in 1997. After considerable debate, representatives of the Galápagos National Park and the fishing industry have agreed to postpone the start of fishing for sea cucumbers until August 10th, according to the Galápagos newspaper and online publication Periodico El Colono. A 45-day season for sea cucumbers had been scheduled to get underway on the first of August, but fishermen weren’t happy with the timing and requested the postponment. Because the sea cucumbers are endangered and the catching of them by fishermen has stirred controversy, the original agreement between the authorities and fishermen had been reached quietly without the usual public announcements. But when the agreement was leaked through social media, fishermen complained about it while most Galapagueños ignored the news. Their attention these days is focused on future protests against changes in the law that they feel could harm the environment and hurt them in the pocketbook. Cost of living bonuses for Galápagos residents would be recalculated under the new Organic Law of Special Regime for Galapagos (LOREG). As we reported earlier in Galápagos Digital, after a four year moratorium on sea cucumber fishing, the Ministry of Environment of Ecuador through the Galapagos National Park Board authorized the fishery from August 1st to September 15 for a limit of 500,000. The agreement between the authorities and a representative of the fisheries sector was signed July 10. Galápagos Digital has requested further information from the Ministry of Environment and the Galápagos National Park and we’ll post any responses we receive. Due to the lack of official pronouncements about the sea cucumber fishery, many Galápagos residents haven’t heard about the issue as they prepare to rally against the changes in the law governing the islands. According to Jairo Gusqui Lopez, leader of the opposition group Frente Insular, people opposed to the new law will meet on Saturday in Santa Cruz to discuss a constitutional challenge to the law that will be submitted to the Constitutional Court of Ecuador next week. Several groups in Galápagos have also announced they will take part in an August 13 general strike that is planned in major cities of the Ecuadorian mainland. These are days of disenchantment in the enchanted islands. The potential opening of sea cucumber fishing in Galápagos has scientists and conservationists surprised and concerned after news leaked of a July 10 agreement that would allow the collection of 500,000 of the creatures, considered vital to the marine environment. It reignites a long dispute that has pitted fishermen against the scientific community. The agreement, signed by representatives of the Galápagos National Park, the Ministry of Agriculture, Livestock and Fisheries and the Governing Council of Galápagos, hasn’t been officially announced, but according to a version circulating on the internet, it would permit fishing to begin August 1st. Following that, there would be a 5-year moratorium on further sea cucumber collection with annual monitoring of the sea cucumber population. If the population grows to more than 11 per 100 square meters, authorities would consider lifting the moratorium. Here is a link to the complete document (Spanish). Population survey of sea cucumbers shows that they number fewer than 11 per 100 square meters in all but one location. Every year, the Galápagos National park and fishermen measure the populations of sea cucumbers around the islands. This year’s survey shows that in most parts of Galápagos, the population is well below healthy levels. Galápagos Digital has requested further information from the Ministry of Environment and the Galápagos National Park on why the agreement was signed. We will publish the responses as we receive them. 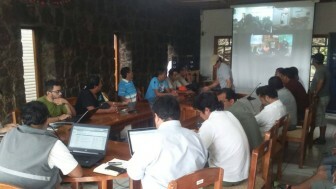 That point was confirmed by a fisherman who wrote to Galápagos Digital asking to remain anonymous: “The managers of the Galápagos Marine reserve failed” (to conduct a proper survey), he wrote. The decision was not received well by members of the scientific community: “Opening the fishery now sends a message that Galápagos natural resources will be managed by political pressure, not by technical decisions,” one expert, who asked not to be identified, told Galápagos Digital. In some parts of the world, sea cucumbers are considered a delicacy and in Southeast Asia, many believe that the creatures possess aphrodisiac qualities to improve sexual performance. That belief has encouraged overfishing of sea cucumbers leading to the decimation of populations. Ecuadorian government efforts to curtail sea cucumber fishing resulted in angry protests by fishermen in 1993 and 2000. Studies by conservation biologists at the Charles Darwin Research Station on Santa Cruz, working in cooperation with the Galápagos National Park, found that the sea cucumber population was severely reduced as a result of overfishing. After the government halted further fishing in January of 2000, fishermen occupied the offices of the Park and the Darwin station, taking some humans and animals hostage. The protests ended peacefully but relations between fishermen and the scientific community remain tense. The area of ​​the Galapagos Marine Reserve is huge and despite constant efforts by the Galapagos National Park and the Ecuadorian Navy, it is difficult to patrol. Poachers from the mainland of Ecuador and other countries illegally catch cucumbers and other species in the reserve. As we reported in Galápagos Digital in June of this year, park officials seized 10,852 sea cucumbers at the airport of San Cristobal. At present there is a huge black market for sea cucumbers driven by demand in China, where they are sold for $ 300 per pound. So far there has been little official information on the matter. The procedure laid down is that once an agreement is signed, it doesn’t take legal effect before the Park management officially announces it. That has not yet happened. Galápagos Digital will stay on top of this story and post updates as developments occur. Once again, the “cucumber conflict” between fishermen and conservation authorities has officials caught in a bind. “Darwin” checking out a giant African land snail . “We recently sent Texas-based trainer Tiffanie Turner back to Galápagos to check on the progress of both the dogs and their human counterparts,” Rebecca Ross, Executive Director of Dogs For Conservation, wrote on the Galápagos Conservancy website. “Tiffanie reported that Darwin and Neville have acclimated well to their new home and to their handlers,” Ross wrote. The odyssey of the canine pair hasn’t been completely problem-free, however. Ross reported that one of the dogs developed “a chronic allergy to a plant found in Galápagos,” although it didn’t prove to be serious. Veterinarians at the Biosecurity Agency have dealt with the allergy, according to Ross. 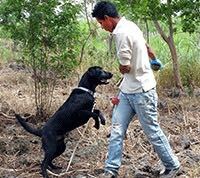 Dogs For Conservation says it hopes that with the continued success of the snail eradication program, set-up with a grant from the Galápagos Conservancy, specially-trained dogs might be employed to detect other invaders that threaten the islands. The U.S. Space Agency NASA has released some spectacular new photos of Wolf Volcano on Isabela Island following its first eruption in 33 years. The explosive eruption at Wolf, the highest volcano on the Galápagos Islands, sent volcanic gases and ash roughly 15 kilometers (50,000 feet) into the sky, while lava flowed through a fissure, down eastern and southeastern slopes, and eventually reached the sea. In early June, the sulfur-rich lava flows on the slopes appeared to subside. This image of Wolf was acquired on June 11, 2015, by the Advanced Spaceborne Thermal Emission and Reflection Radiometer (ASTER) on the Terra satellite. The colors are not real; the photography combined near-infared, infared, red and green light, with vegetated areas appearing in red and lava generally appearing charcoal or black. From June 12-16, seismologists from Ecuador’s Instituto Geofisico-Escuela Politécnica Nacional (IG) detected increased activity inside the caldera near the southern rim. The 7-kilometer (4 mile) wide caldera is nearly 700 meters deep. New lava is paving over deposits that were laid down in a 1982 eruption. Wolf is a shield volcano, with relatively broad but gentle slopes (like a Polynesian warrior’s shield) where one lava flow tend to spread out across previous flows. The volcano rises 1,710 meters (5,609 feet) above sea level, sitting near the equator and atop a volcanic hot spot. In the early days of the 2015 eruption, conservation groups feared for the safety of a rare species of pink iguanas, which are only found on Isabela Island, and for the local population of giant tortoises and yellow iguanas. Those creatures haven’t been endangered so far by the eruption because ash and lave have tended to flow east and southeast, while the animals live mostly to the north and west of the summit. Galápagos National Park rangers deliver tortoises to their new home on Santa Fé Island. At four in the morning of June 27, while most Galapagueños slept, a team of rangers and scientists of the Galápagos National Park loaded 201 young tortoises on the vessel Sierra Negra in Puerto Ayora on Santa Cruz Island and sailed on a historic journey. It took an hour and a half to get to the island of Santa Fé and what made the crossing significant is that it marked the first time tortoises have inhabited the island in 150 years. “More than twenty-five park rangers transported the tortoises from the coast to the central zone of the island where they were released, approximately three kilometers from the coast,” said Danny Rueda, Director of Ecosystems of the Galápagos National Park. This operation is part of an ambitious and creative effort by the Galápagos National Park, in collaboration with the organization Galápagos Conservancy to restore tortoise populations on islands where the iconic creatures have become extinct. One of these islands is Santa Fé, also known as Barrington, a small island of just 24 square kilometers (9.3 square miles) of surface located in the center of the archipelago. In the eighteenth and nineteenth centuries, buccaneers and whalers, seeking food for their long voyages, decimated the population of giant tortoises on Santa Fe and other islands. Later, when fishermen introduced goats to the islands, the goats ate away the vegetation that sustained the surviving tortoises—the final blow leading to their extinction. Current genetic analysis of bone fragments suggest that the Santa Fe tortoises, Chelonoidis sp, may be similar to those of Española Island, Chelonoidis hoodensis. That’s why the 201 Española tortoises are substituting for the original population. The scientific name Chelonoidis hoodensis comes from the name “Hood” given to the island on old English navigational charts. “The use of an analog species (the Española tortoise) that can replace the original extinct species (the Santa Fe tortoise) is a new approach for ecosystem restoration in Galapagos and can provide a model for the world,” said Dr. Linda Cayot, Science Advisor for Galapagos Conservancy. The tortoises are between 4 and 10 years old and were bred in captivity at the Fausto Llerena breeding center on Santa Cruz Island. In 1971 the Galapágos National Park eradicated goats and vegetation returned, helped by heavy rains during years when the El Niño phenomenon was active in the Pacific Ocean. Currently there are 250,000 Santa Fe Opuntia cactus, mostly adults; and 6,500 land iguanas (Conolophus pallidus). 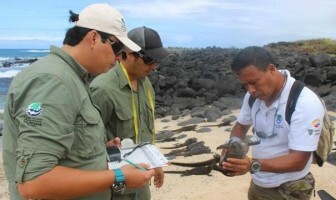 In a news release the Galápagos Conservancy said the purpose of the project is to establish ��a reproductive tortoise population to fill the historical role of ecosystem engineer on Santa Fé.” To keep track of the tortoises, 30 of them were fitted with radio telemetry transmitters so their positions on the island can be tracked. Fenced-off areas were created on Santa Fé Island in 2014 where tortoises and iguanas won’t be able to feed on the vegetation. Preparations for this reintroduction took several years. In 2014, a team from the Park staff and Galapagos Conservancy traveled to Santa Fe and fenced off areas where the tortoises and iguanas will not be able to consume the vegetation. That way, scientists can compare the impact of native herbivores on the ecosystem in areas where they can and can’t feed on the local plants. An important part of the Project, added Rueda, is the evaluation over time of ecosystem changes due to the presence of the tortoises, as well as the interaction between tortoises and land iguanas, especially for shared resources such as food. The Ministry of Environment of Ecuador and the Galápagos National Park announced in a press release that they have planned a special remembrance of Lonesome George, the last of the species of giant tortoise from Pinta Island. When Lonesome George died on June 24, 2012, he became the face of extinction for his species. According to the statement, “the Galápagos National Park and the Ministry of Environment, working with the organization Galapagos Conservancy, will reintroduce 205 giant tortoises to the island of Santa Fé” after the last tortoises there disappeared 150 years ago. The news release said the operation will take place on Saturday June 27, 2015 and will be a symbolic tribute to the memory of Lonesome George. “In Ecuador, we tried very hard to preserve this species, but time was not on our side,” said Lorena Tapia, Minister of Environment of Ecuador. “Even after his death, Lonesome George is a symbol of the efforts invested by the country and the international scientific community to conserve endangered species,” said the statement of the Park and the Environment Ministry. On Santa Fé, scientists and park officials are employing a new tactic. Because the original Santa Fé tortoises are extinct, the new ones that will be introduced actually hail from Española Island. The scientific name for their species is Chelonoidis hoodensis (after “Hood,” the name English navigators gave to Española). As we reported in Galápagos Digital, Lonesome George’s body was sent to New York where he was embalmed at the laboratory of George Dante taxidermy. He was exhibited at the American Museum of Natural History in New York from September 19, 2014 to January 4, 2015. Since then the body has been under the expert care of Mr. Dante who, according to the park, recently reported that George is undergoing additional preservation procedures that will take 4 months to complete. We were saddened at last week’s news of the demise of the Galápagos tortoise “Speed,” who lived to 150 years, give or take a few. The San Diego Zoo took him from the Cerro Azul volcano on Isabela Island in 1933 as part of an effort to preserve the tortoises there. During his time at the zoo, Speed was put into a breeding program that resulted in the births of 90 baby tortoises. But time took its toll on the old boy. The zoo’s primary caregiver of Galápagos tortoises for the last 2 1/2 years, Jonny Carlson, said that Speed was in so much pain that the decision was made to euthanize him. The newspaper reported that before the decision was made to euthanize Speed, the San Diego Zoo staff had worked tirelessly to keep him alive, using methods like hydrotherapy, acupuncture, medications and physical therapy. Dr. Robert Ballard’s Exploration Vessel E/V Nautilus and its Corps of Exploration are currently looking into the depths of the Galápagos Marine Reserve and they’ve been sending back some fascinating video from thousands of feet below the ocean surface. You can follow their live video stream on the Nautilus site via this link. It’s part of their most ambitious expedition season yet, exploring sites ranging from the Gulf of Mexico to British Columbia through late September. The Galápagos part of the expedition runs through July 5. Of particular interest to Ballard’s group are the hydrothermal vents in the Galápagos Rift region. In 1977, scientists found evidence that life could be sustained from chemicals coming out of the Earth’s crust rather than from sunlight. Some of those vents are at a depth of 8,000 feet. Chemosynthetic bacteria, drawing energy from seawater-rock interactions at the vent sites, make up the foundation of the food chain for a variety of organisms including clams, mussels, and tubeworms. Many of those rare creatures have now been photographed by Ballard’s cameras. Ballard, the Director of the Center for Ocean Exploration, in the Graduate School of Oceanography at the University of Rhode Island, is best known for discovering the wreck of the steamship Titanic in 1985, the German battleship Bismark in 1989 and the aircraft carrier USS Yorktown in 1998.